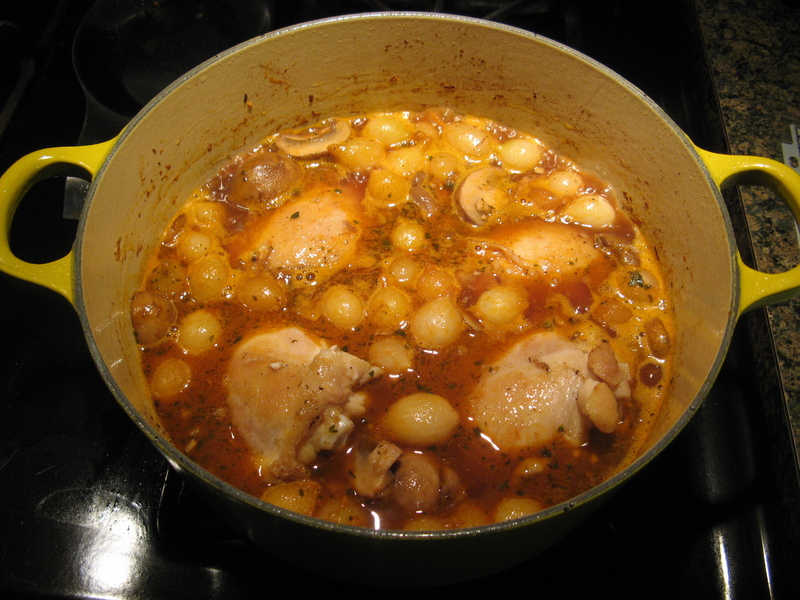 The first time I had Coq au Vin was at a cooking demonstration class at Williams Sonoma. I purchased the braising base that was used at the class but unfortunately my result was nothing like the one I tasted at the class. I think part of the reason was that I still wasn’t all that comfortable with cooking – I’m more of a baker, but, slowly but surely my cooking ability is starting to even out with my baking ability. Recently I came across a recipe for Coq au Vin in a magazine and decided to try making it once again, this time from scratch, and I had much better results. 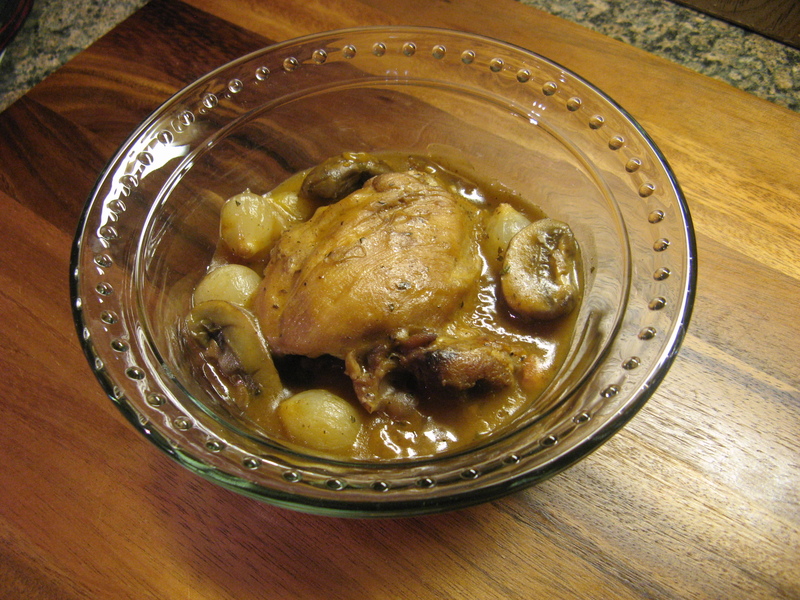 And in case you are wondering, Coq au Vin is a French dish of braised chicken in red wine and normally contains bacon, garlic, onions and mushrooms. 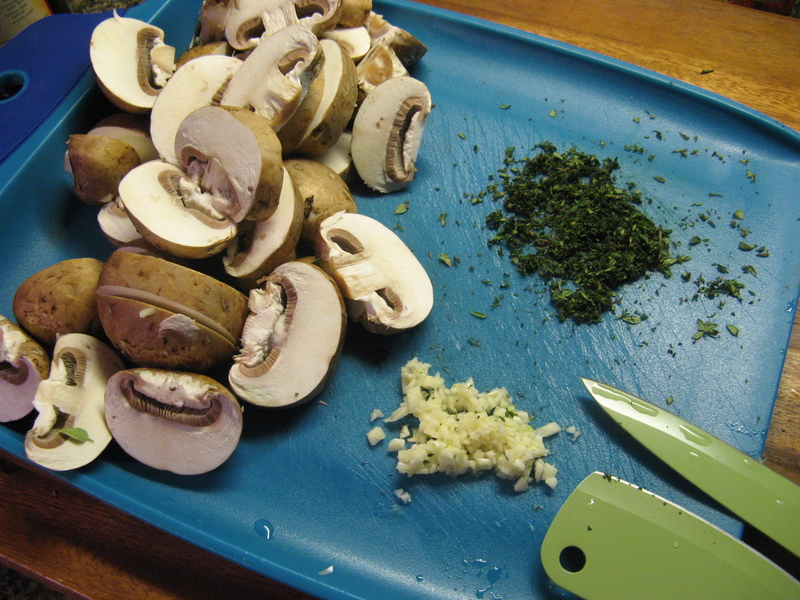 Up first I sliced baby bella mushrooms, minced 2 cloves of garlic and chopped some fresh thyme. I then cooked three slices of bacon, which I cut into half-inch pieces, in two teaspoons of olive oil until they were brown, but not crispy. After removing the bacon from the Dutch oven and setting it aside I browned four chicken thighs which I seasoned with salt and pepper. 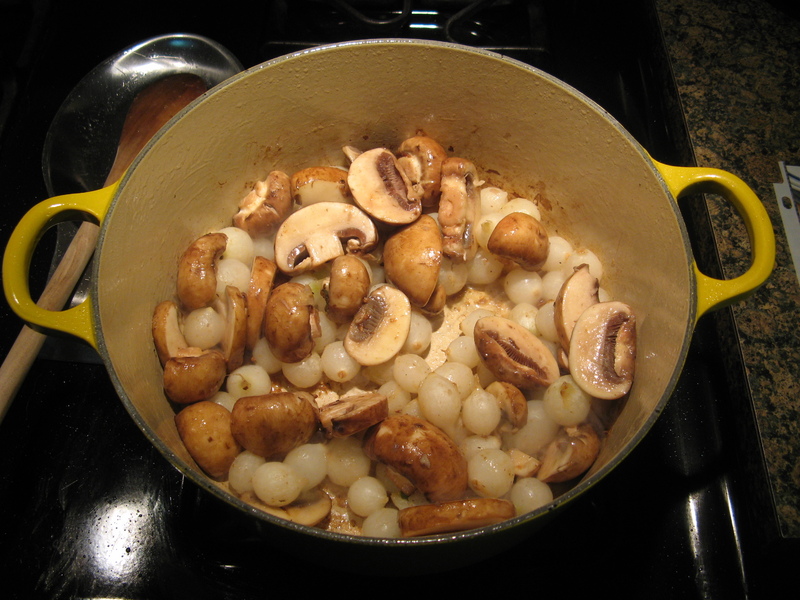 Next I cooked the mushrooms along with a 16 oz. bag of frozen white pearl onions for a few minutes until they began to soften. 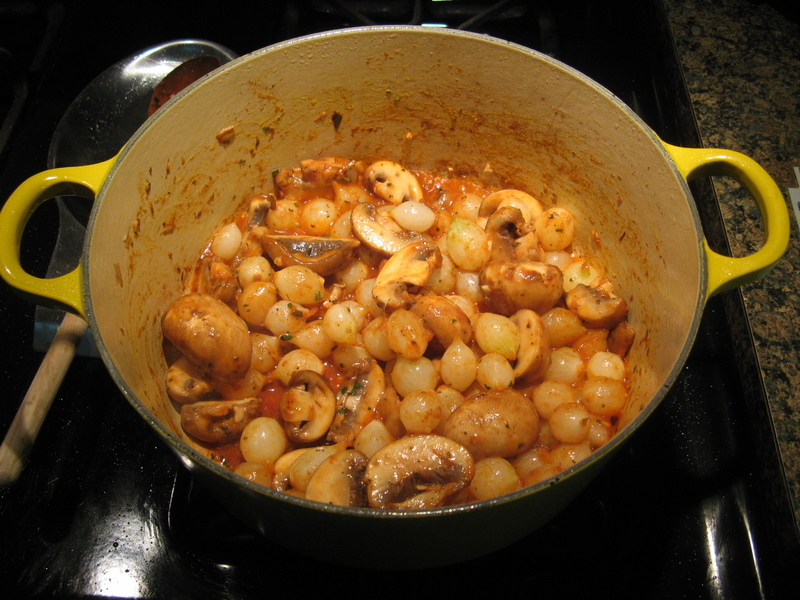 Following that I added in the thyme, garlic and a tablespoon of tomato paste. And then added in chicken stock. And finally I returned the chicken to the pot, reduced the heat to low and partially covered the pot and allowed the chicken to cook through and the onions to soften, about 40 minutes. And for the final step, I dissolved three tablespoons of cornstarch in an equal amount of water and added it to the cooking liquid after transferring the chicken to a plate. 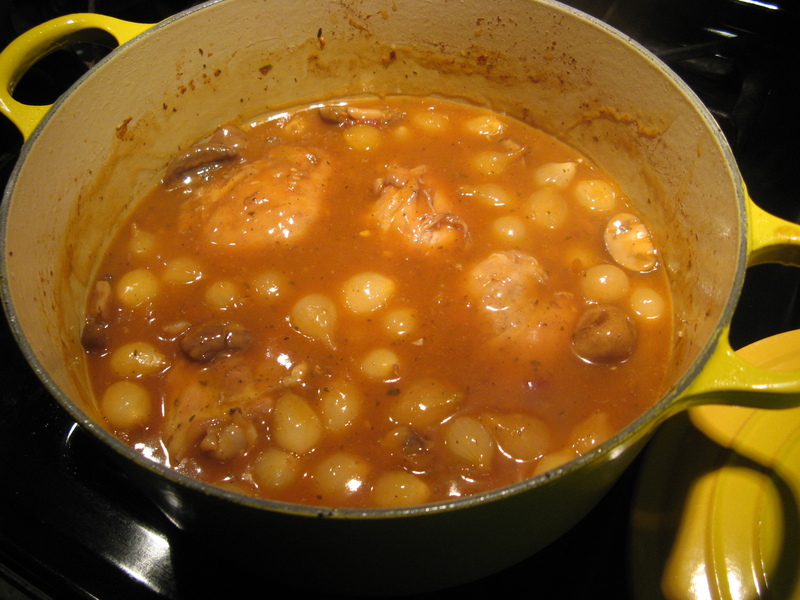 Once the liquid thickened I returned the chicken and bacon to the pot, stirring to coat the chicken. I must say I have used cornstarch to thicken cooking liquids before but I normally just add it directly to the liquid, dissolving it in water is a much better method as it eliminates the possibility of any clumps forming in the liquid. Final Verdict… Definitely something I will make again, although I think next time I won’t add the cornstarch. 1. 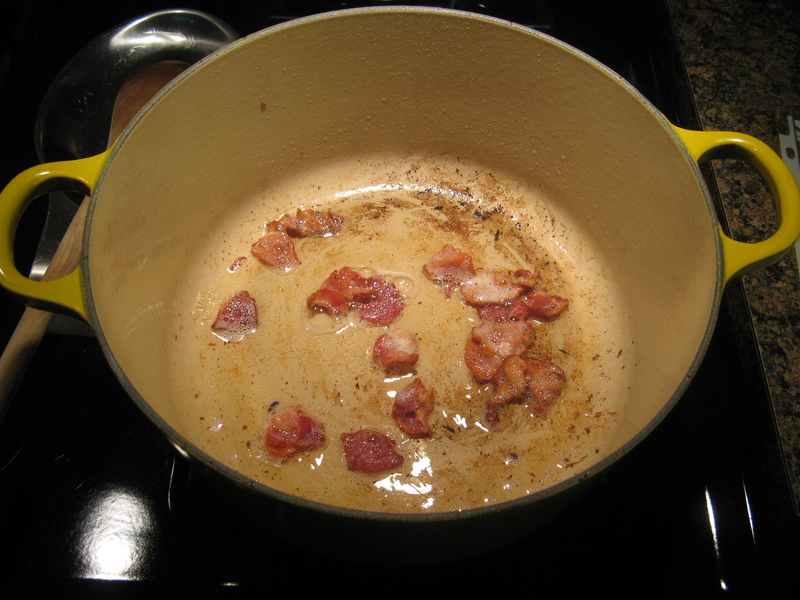 In a 5 to 6 quart Dutch oven, cook the bacon in the oil over medium heat until browned but not too crispy. Transfer the bacon to a small bowl lined with a napkin. Season the chicken with salt and pepper (I used about 1/2 tsp. each). 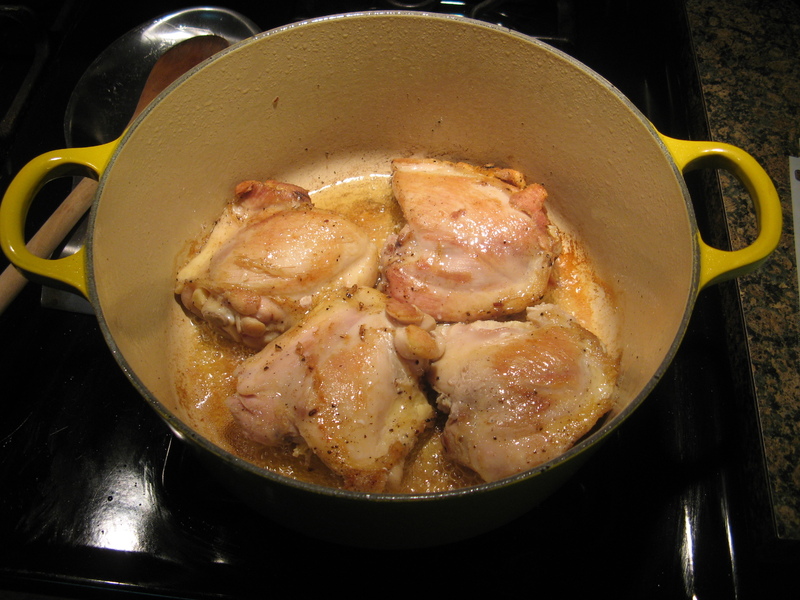 Increase the heat to medium-high and cook the chicken until golden brown, about 5 minutes per side. Transfer the chicken to a plate. 2. 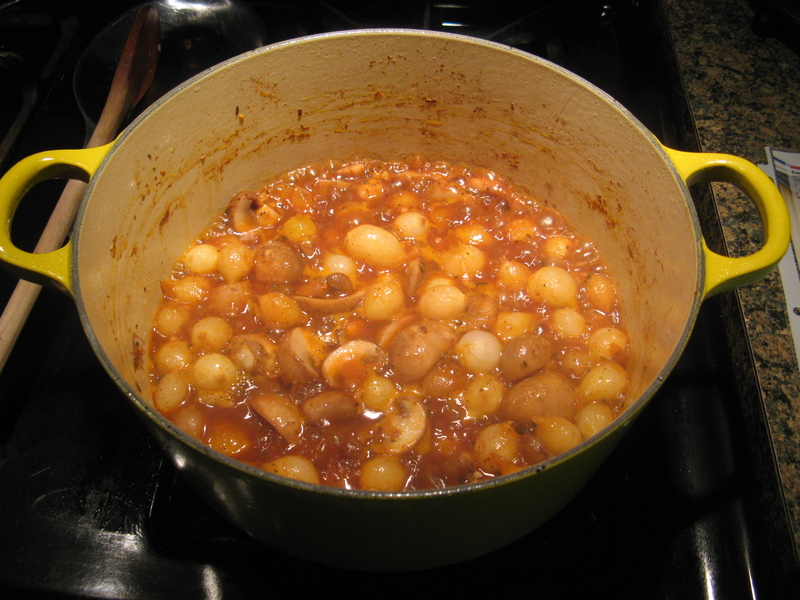 Add the onions and mushrooms to the pot and cook, stirring occasionally, until they soften. Stir in the tomato paste, thyme and garlic. 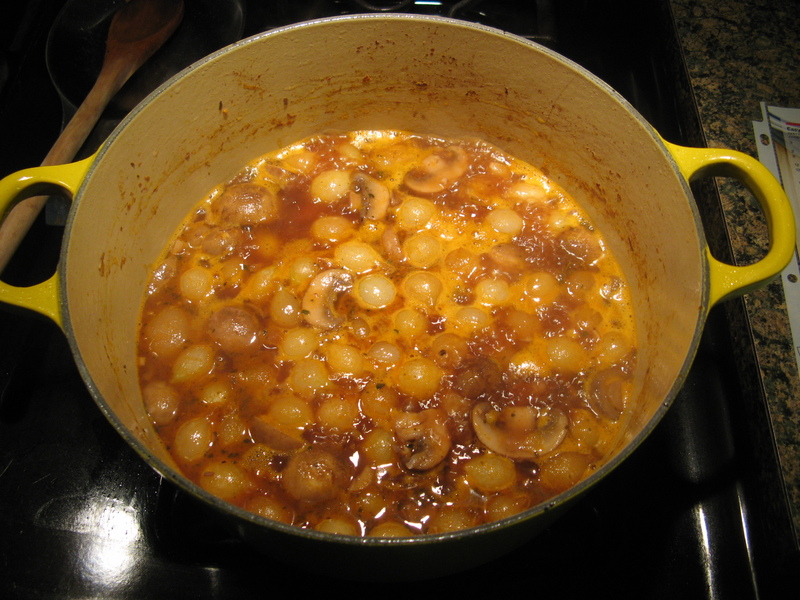 Add the wine and cook, scraping up any browned bits, until the wine is reduced by half, about 5 minutes. Add the stock and bring the liquid to a simmer. Return the chicken and any juices to the pot. Reduce the heat to low, partially cover and gently simmer, turning the chicken once or twice, until the chicken is cooked through and the onions are tender, about 40 minutes. 3. In a small bowl dissolve the cornstarch in tbsp. water. Transfer the chicken to a plate. 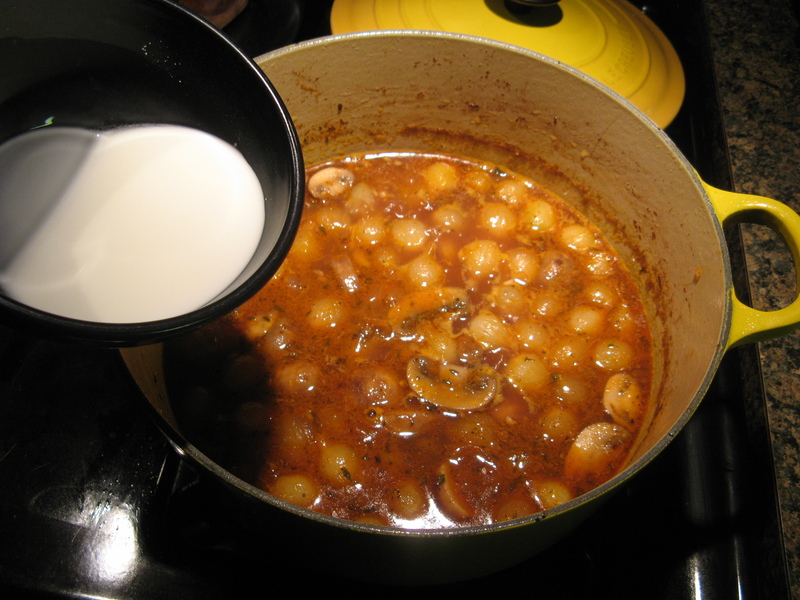 Increase the heat to medium-high and bring the cooking liquid to a bowl. Add the cornstarch mixture and stir until thickened. Season with salt and pepper. Return the chicken and bacon to the pot, stirring to coat. « Cheesecake… Is it a Pie or a Cake? Thanks… It was delicious and quite easy to make!